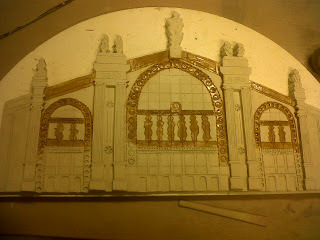 Last night's task was to paint with shellac the sections of the clay facade that I wished to stand out in slight relief. 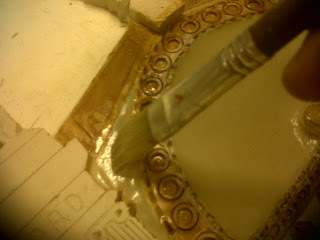 Then with either a damp sponge or a wet brush actually wipe away the non-shellaced sections so that they recede - thus leaving the shellaced areas in relief. This procedure works because the shellac is resistant to water. One paints on the shellac with a suitable sized paint brush and then leaves it for about 15 minutes to dry. One needs a large bowl of very warm (as warm as one can bear to touch) water to keep cleaning the sponge or brush in. Every 5 minutes or so one has to change the water as it gets saturated with the clay that one has removed. 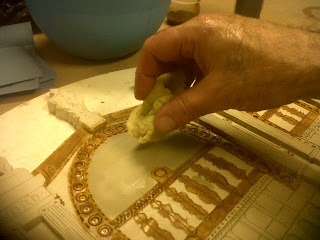 The shellac protects the clay from the water. Sponging away the main window. Unfortunately, when lifting up the facade at the end of the evening, it slipped and some of the little statues were knocked off. But, apparently, they can be stuck back on. Ceramics seems a fairly forgiving discipline. Next week, the clay will be bone dry and after the tidying up of some rough edges and sticking the statues back on, it goes in the kiln!!!!! May I once again praise our lecturer, Pauline. She is really an excellent teacher in every way. Very hard-working, encouraging and most importantly she facilitates honest and open discussion between herself and each of her very different students. Have concluded that the symphony, concerto or large choral works are the best forms of classical music to see performed live. Whereas a CD or download can capture the solo piano or other small scale chamber pieces, only a live performance can convey the physical elements of large scale orchestral works. Furthermore, there is so much to watch when an orchestra plays: the conductor, the different instruments and the way the different sections of the orchestra come together. With this in mind, may go to the City Halls tomorrow to see Donald Runnicles conduct the BBC Symphony Orchestra in Brahms' Symphony no 1 and Schumann's 4th.